Avocado boats, where have you been all my life? From now on, I am making avocado boats out of any and everything! 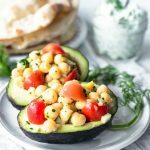 This version with chickpea salad was just delightful! There are a LOT of elements to this meal. Let’s break them down for you. Make sure to use some ripe, but not so ripe avos. Slice your avocado in half, remove the seed. 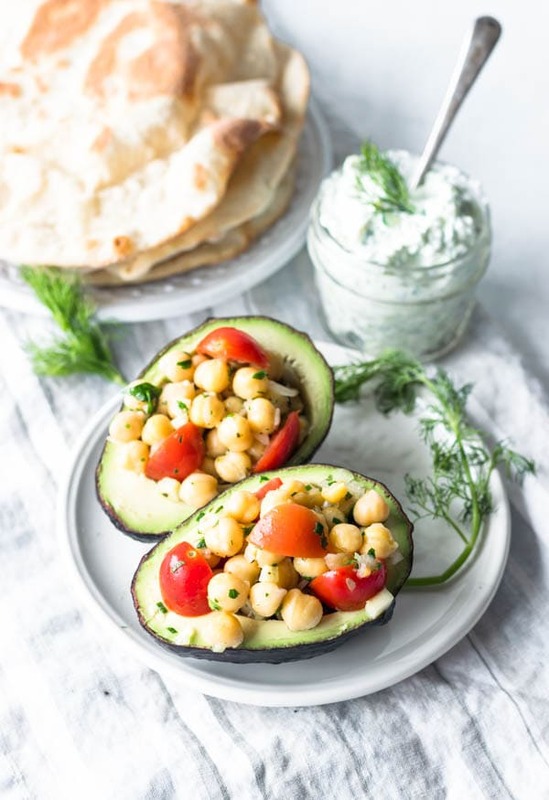 Scoop out about 1 tablespoon of filling out, so you have room to pile the chickpea salad over the avocado, and go to town! This salad will be perfect for your meal prep! You can easily make a lot of it, and it can last you a few days, not to mention, you won’t be bored at all from eating it. 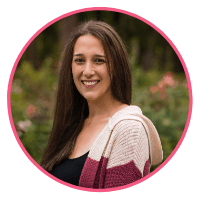 You’ll actually be ready to make some more in no time. That’s cause it’s the bomb! I feel like this chickpea salad deserved its own entire post! My mom used to make this when I was a child. And this salad was simply perfect for that! Al dente cooked chickpeas, mixed with chopped cucumbers, tomatoes, onions, parsley and chives! Seasoned with EVOO, apple cider vinegar and salt! Badabing! Prep time is like 20 min, soaking the garbanzo beans is what will take you the longest, unless you use canned. This recipe for Pita Bread is quick and easy! And nothing will ever beat homemade Pita Bread (or any kind of bread, for that matter). Just make it. It’s therapeutical! In any case, feel free to use store bought! At the end of the day, whatever suits you better is what will be therapeutical! Tzatziki is my favorite. I enjoy making it, eating it, smelling it, starring at it, talking about it. It’s a fairly simple sauce to make. You simply mix cucumbers, yogurt, dill, garlic, lemon juice, salt and pepper. A couple steps could really improve the quality of your tzatziki sauce. And they are: straining the yogurt, and draining the cucumbers! Even if your yogurt doesn’t seem runny and full of water, do strain it. Once you place it over a strainer lined with a doubled cheesecloth, you will see what I’m talking about. You’ll be like: where did this water all come from? And for the cucumbers, simply mix the diced cucumbers with some salt and let it sit over a strainer for a little while to let the water drain. Read it in details below in the recipe. And this is a typical meal at my house. I will strive to post more of my meals and not only my desserts, but truth be told, I have a hard time photographing food that isn’t cake, pie and cookies haha. That’s cause they are naturally beautiful. But now, cmon, look at this avocado boat! Is there anything more beautiful than this? This meal is addicting! 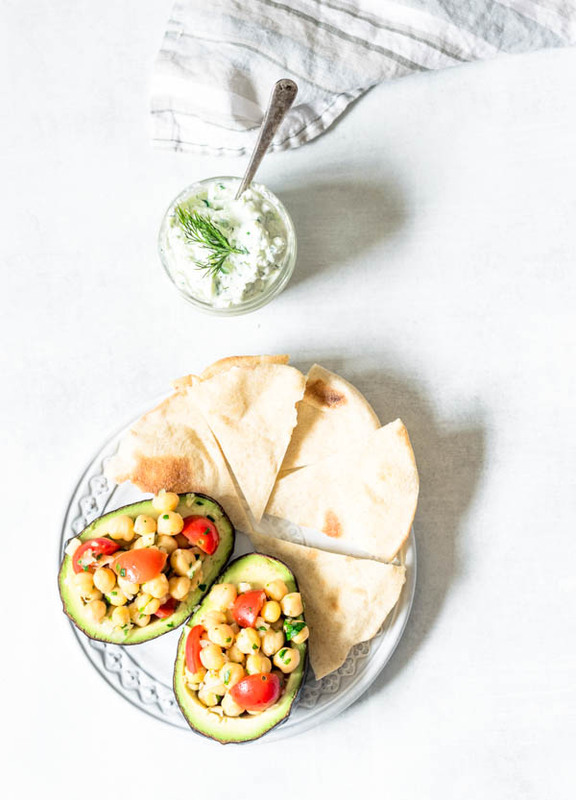 The texture of the chickpeas, with the creamy avocado, tangy tzatziki and the delicious pita bread, will win you over! I've served this to my guests and just couldn't hear the end of it. Everyone was delighted! Optional: you can add some chopped mint basil, dried oregano, or any herbs you’re fond of. If you aren’t using canned garbanzo beans, first, start by soaking your beans for 12 hours or overnight. Drain it and rinse it after soaking. Place it in a pressure cooker and cover with 6 cups of water, add a bay leaf for flavor, if you’d like. Bring it to a boil, place lid on pan. Cook on medium high for about 12 minutes. Let pressure of the pan release naturally. Drain beans. You may rinse them with cold water to bring their temperature down. Mix them in a bowl with all the other ingredients. Refrigerate until ready to serve. It will see in your fridge for about 4 days. Start by peeling your cucumber. Dice it really finely and combine it with 1 teaspoons of kosher salt. Place it in a strainer and let it drain for about 1 hour. Occasionally, press it down on the cucumbers, to help drain the water out. Alternatively, you can place a plate directly on top of the cucumbers and then place a heavy bowl or something heavy on top of it, to help draw the water out. Place yogurt in a strainer lined with two layers of cheese cloth. Let it drain, over a bowl, in the fridge, for about 2 hours. I like to often squeeze the cheesecloth to help draw a lot of the liquid out. Those two tricks are the secret to obtaining a very thick and smooth tzatziki. Sometimes your tzatziki will be firm on day one, bu on the very next day, it will be all runny and full of liquid, because you have skipped these two important steps. After both cucumber and yogurt have drained, you may place all ingredients in a bowl and stir them together. Taste for seasoning. Refrigerate for at least 30 minutes before serving. Sauce will keep for a couple days in the fridge. Slice avocado in half. Scoop out about 1 tablespoon of the avocado flesh out. This way, yo have more room to pile high a bunch of the delicious chickpea salad. Scoop the flesh out and eat it, obviously. After all, what else would you do with a perfect tablespoon of delicious avocado? Spoon mountains of chickpea salad over avocado boats. Serve with tzatziki and pita bread on the side. You can come here and thank me later, for this will be one of the best meals you’ll have, ever! 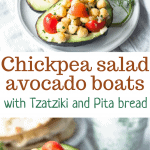 What a delightful recipe and I love how you put them in avocado boats! How fun! I love everything in this recipe post. I’m a big chickpea fan and use them a lot in salads or with pasta. 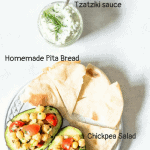 Love avocado, tzatziki and pita bread too! This would be a perfect lunch for me! This is the perfect lunch! Thank you Jacqueline!! TZATZIKI is one of my favorite condiments as well. I love all of your fresh flavors! This sounds so delicious! I haven’t really tried chickpeas before but I’m excited to try this recipe with chickpeas!! You should totally try chickpeas!! They are delicious!! 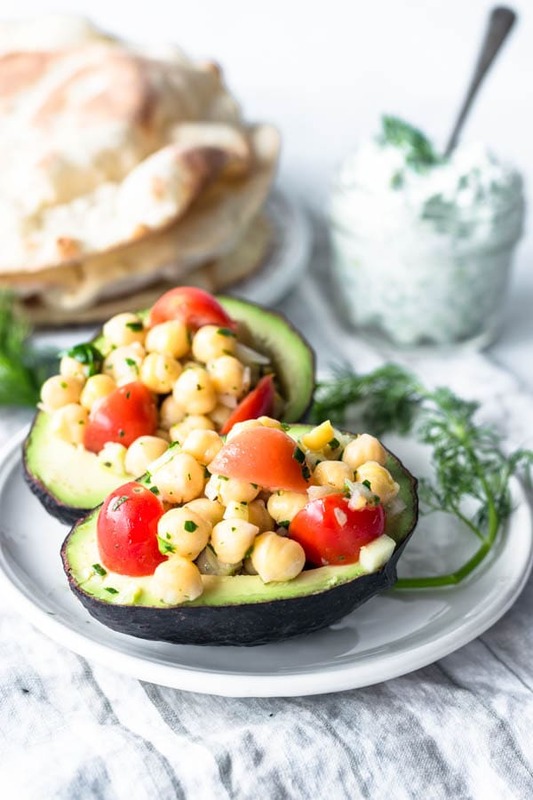 Spoon mountains of chickpea salad over avocado boats sounds delicious and i can’t wait to serve it for breakfast. Thanks for sharing. This sounds remarkable! I am huge chickpea fan and believe, like you said, it could qualify for it’s own post! This looks delicious and healthy and very rarely do I like straight vegetarian dishes, but this looks like a great idea for a girls day brunch. Thank you so much for the idea. There’s so many great elements in this recipe and it has inspired me to try avocado boats. It’s given me so many ideas for new dishes! This is so creative! It’s totally a great way to fit avocados into the meal. Your tzatsiki eclipse sounds amazing.